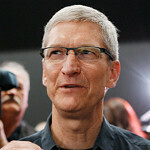 Cook: Apple will move some production to U.S.
Apple CEO Tim Cook was taped on Thursday answering questions for NBC's Rock Center. During the interview, the executive revealed that his company plans on moving production of a line of Macs to the U.S. from China. Apple has most of its products assembled in China, like the Apple iPhone, and the Apple iPad. But Cook noted that the most expensive part of building these consumer electronics is purchasing chips which are made in the U.S. Cook wouldn't reveal exactly which product will be made in the states, but did say that U.S. production would include more than just final assembly. Apple's contract manufacturer in China, Foxconn, has been attacked by organizations for hiring underage workers and for generally poor working conditions. Cook said in the interview that companies like Apple have their assembly work done in China not just because of the lower salaries, but also because the manufacturing skills required to build, say, an Apple iPhone, aren't present in the U.S. anymore. The U.S. based assembly line will cost Apple $100 million in 2013 and Cook said, "This doesn't mean that Apple will do it ourselves, but we'll be working with people and we'll be investing our money." The production being moved to the U.S. is a small part of the Cupertino based firms' overall business. Sales of the Apple iPhone and Apple iPad swamp sales of the company's Mac line of computers. Under Cook's watch, Apple's shares have risen 43% even after Wednesday's huge decline, and the company has has released two new Apple iPhone models, two new versions of the Apple iPad and the Apple iPad mini. The CEO said it was time to bring some jobs back to the United States. While things have been going well for Apple, the executive did admit that the company made a mistake with Apple Maps. "We screwed up and we are putting the weight of the company behind correcting it," the executive said. 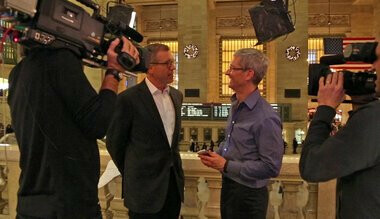 The interview with Tim Cook will be shown on Thursday night on Rock Center broadcast at 10pm/9pm central time on NBC. Apple has been on my naughty list for some years now, but this is a move really happens it could really change how many people view the company. Tim Cook has done a phenomenal job trying to change Apple's image these last couple years and this is a huge step in the right direction. they still have a long way to go, but even I must give it up to Apple on this one. Agreed, now he needs to get Apple to drop their petty patent lawsuits. Wow just looking at the article makes me bored & desperate for ACTUAL NEWS!!!! Hey bro, this is better than nothing, and at least a small step in the right direction. Hopefully there will be more, but all journeys begin with a simple step in the right direction. I feel you on this but my problem with Apple is that they are known to throw the wool over your head. I want to "see" them walk the talk, instead of talk the walk. You know what I mean? +1 to you too. Maybe I'm just one of the people that is wanting to believe this. I know Apple doesn't have the best track record with the whole "wool over the head" deal lol, but I want to believe that this is going to happen, and hopefully goes a lot further than this. I am with you on this also. I hope this is the start to something good, ESPECIALLY from Apple. What bothers me the most about your statements is that you act like Apple as a company is this singular personality. What Apple does is dictated by the people who run it. Steve Jobs was good at a lot of things, but I think we can all agree that he lacked...a lot...in other areas. Since Tim Cook has taken the helm, he has at least sat down with rivals to open up some kind of dialogue. He gave his retail employees raises (even though they were making a few bucks more than most retail workers). And he is bringing production back to the US. Even if it's only SOME Apple products, it's a big deal. It sends a message that the most profitable company in the US is taking some measure to bring jobs back to the US. How many jobs have been sent oversees by other companies? Even if it's just one product, maybe this will spur more companies to do the same. Apple isn't completely changed. But you guys hated Steve Jobs and what Apple was under him towards the end. Now you're getting something different and personally...even as a fan of Apple and Jobs, I'm loving what Cook has done so far. Jeff, firstly, I never said other companies didn't engage in that behavior of having everything manufactured overseas. Second, every post I've written on this thread is supportive of Apple in this move. So, please save the self righteousness for another day and another thread. I applaud Apple for doing this, and hope it is a sign of more things like this to come. WTF more do you want? Personally I like Cook better than Jobs. Don't care how much hate I get over that comment but its just my opinion. Well too bad that I judge a company by their actions, not by their talk. Apple has a LONG history of "putting the wool" over people & their customers heads. To me talk is cheap, until I see it then I will believe it, & that is with anything. Apple has this negative stigma based on their actions & only their actions. Once their actions show otherwise then & only then will Apple's perception change. I never insinuated that Apple is a "singular personality" you just put words in my mouth. Apple is just a corporation with very sketchy inner workings & philosophy. That is why lots of people have beef with Apple. "Cook said in the interview that companies like Apple have their assembly work done in China not just because of the lower salaries, but also because the manufacturing skills required to build, say, an Apple iPhone, aren't present in the U.S. anymore." BULLSH*T!!!!! hm, a United States grown man or woman with public education in the U.S. versus some 14yr chinese kid with no education, Oh and the Chinese worker will eventually either be involved in a riot with FOXCONN, go on strike due to horrible working conditions, or take part in a demonstrative mass suicide becuase of working conditions. Yeah if I was Apple I would either take any representation of "designed in America" of all of Apple's products and continue outsourcing jobs...or brink all the work back to the U.S. and take pride in the ridiculous prices their charging for crappy products!!!!!!! lol, here's what they are gonna "move". Manufacturing of the glass (likely corning) and hike the price by $100 per device. Especially with union workers, it would be interesting to see how much apple products cost compared to the nondomestic version. There you go, bring jobs back into our country, don't stop there tho, bring more jobs back. Apple's profit margin is so high already, cutting that margin a bit by using American labor won't hurt them. Next, have a revamped open OS will probably push me to buy an iPhone. Maybe tim cook as ceo is going to be different after all. Apple could move all production to the US and still make a healthy profit margin, and help the economy and their image big time in the process. Kudos to Apple for this, and I hope this is a sign of things to come. hopefully this creates job here. it's funny to hear companies say "companies like Apple have their assembly work done in China not just because of the lower salaries, but also because the manufacturing skills required to build, say, an Apple iPhone, aren't present in the U.S. anymore." when these companies were the ones to outsource our jobs in the first place. if the jobs had stayed here ppl would learn/have those skills. either way it's nice to hear that a major company has gotten their head out of their a$$ and is moving in the right direction. I hate to say it, but if Apple made all their products in the US, THAT would get me to move to iOS.. and I am a MS fanboy.. But American jobs are more important. Apple creating jobs in the US is amazing. Wether you like their products or not, this is a great move. I'm still far from being a fan of apple but this is a grewt move and I support this decision. What a load? The skills to put together a phone don't exist in the US anymore? But a 16 year old who hasn't even finished school does? Right! I've done manufacturing before and there is no difference in skill level at all. The difference is the willingness to put up with 16 hour work days, 6 or 7 days a week with very few breaks, living on a company campus while bunking with 10 other co-workers and the beatings for not making your goal. That just isn't gonna fly here. The conditions in those factories were inhumane at best, and using our imaginary lack of skill to cover up company greed is almost as deplorable. main reason for producing our consumables in other countries are cheap labor, no environmental laws, labor laws, and labor unions to cut into the margin. Hmmm... I smell many american-wannabe indians here. What moron is going around thumbing down people for supporting Apple doing this??? Please whomever is thumbing down my posts on this thread I challenge you to give a legit reason for it. I am not a big fan of Apple's policies, that isn't news. That said, I support this big time. Any American company bringing jobs back home from overseas gets a thumbs up in my book! And, if this leads to more of the same, then two thumbs up! Heck, nevermind. Whomever you are, if you don't like jobs coming home to the US, then go take a long walk off a short pier. I don't care.